By not negotiating their salary, candidates are leaving serious money on the table. You don’t want to do that too! The more the company wants you for the role and the more closely you match the requirements in the job description, the more leeway you have in the negotiation. And the less you need the job, the more you can gamble. Your chances of a successful negotiation obviously get better too the closer your ask is to their offer. Not meeting all of the above criteria is a risk and it’s possible the company could not meet your expectations and/or pull the offer. If you really need the job or it’s your dream job, you’ll have to determine whether negotiation is worth it. Every situation is different and it’s up to you to decide whether you should proceed with a negotiation. Candidates don’t realize that salary negotiations are won before the offer has even been extended. Each time that money is discussed in the interview process is an opportunity to build your case for the salary you want. If you are wondering when to negotiate your salary, the answer is FROM THE BEGINNING of the interview process! Prepare for salary discussions by practicing and writing down what you want to say ahead of time. That way you’ll be confident and collected when you’re asked to discuss salary expectations at any point in the process. If you prepare for the negotiation from Day 1, you’ll have a higher chance of getting an amazing first offer. Be Someone You’d Like to Work With! 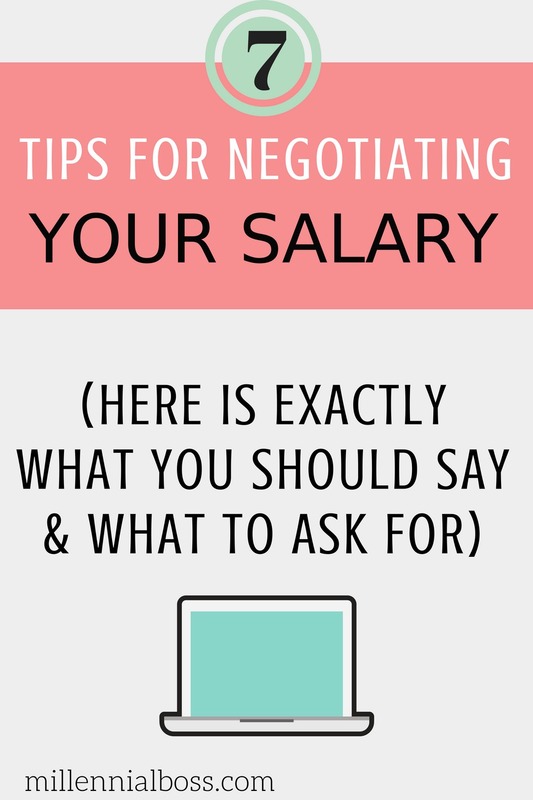 Salary negotiations can be awkward so it’s best to remain pleasant, professional, and excited about the job during a negotiation. Candidates that come across as entitled or demanding will not fare well. Come to the table with market research and concrete numbers. Don’t ask for “more” ask for X more. Be specific. Read body language and verbal cues to know when to press forward and when to back off. A competing offer is power in salary negotiations. If you have a competing offer, just make sure that you state the competitors in a non-obnoxious way. Negotiations are a delicate balance where you both you and the employer need each other to succeed. You want a job and they want to fill a position with a good candidate. While you want the scales tipped a little in your favor as the candidate, it will never be totally tipped so that you have all the power. So be polite as possible and use the competing offer to your advantage. If you have evaluated both offers and one offer is clearly better than the other, use the better offer to increase the other offer. Call the hiring manager or recruiter back and say, “I heard back from X company and they offered me Y amount with Z other features. Your company is my first choice and I really want to work for you, would you be willing to match that?” Or alternatively, “would you be willing to offer X + 5k?”. If you handle it right, be specific, and the four criteria are met, you will get it. Don’t be too vague. Wishy washy conversation makes you and the recruiter uncomfortable. Don’t make it more awkward than it has to be. Readers, have you ever negotiated a job offer? Do you have any advice for millennials on negotiating salaries? Congrats again fro your blog! Thanks! Would love to see the women are more successful at negotiating research. I thought research shows the opposite! Great post and great recommendations. As a hiring manager who has seen this play out in many situations, I would add a couple additional thoughts. 1 – people should also consider more than just base salary when negotiating. 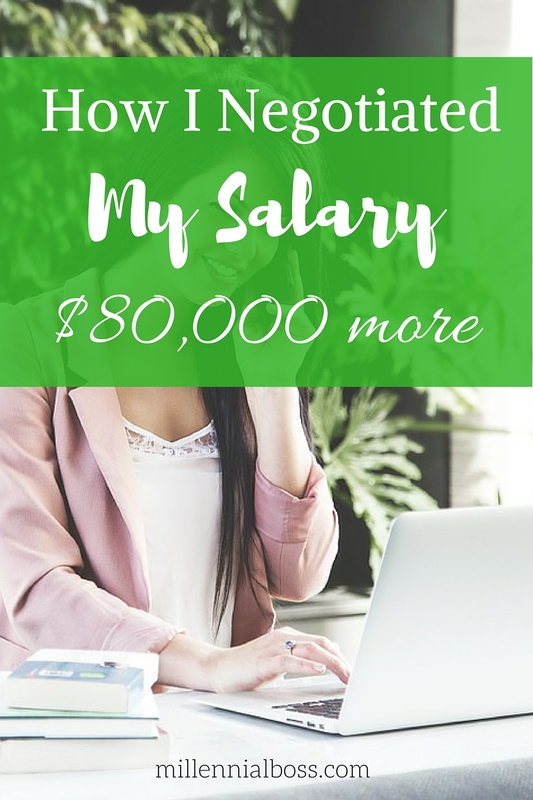 For many companies, there are constraints when it comes to base salary based on a candidates years of experience or the position being offered. However, hiring managers are often able to give one time signing bonuses, provide additional vacation time, waive 401k vesting requirements, etc. 2- Know when to stop. I’ve seen people ask for way too much or try to over negotiate a deal and just make the hiring manager and HR rep frustrated. Once that happens, it rarely works out in the candidates favor. Great tips! I would love to know more about how to negotiate vacation time. Does that just mean asking for unpaid time off or getting a previously planned trip approved? Your four criteria for determining if a negotiation is worth it are spot on. Learning to determine your market worth and bring in factual data to back up your case are such important career skills that will come up many times in one’s professional life. Thanks for sharing!